(21231.455, Bob Burke Collection, OHS). (22162.P.AT.07, The Journal Record Collection, OHS). 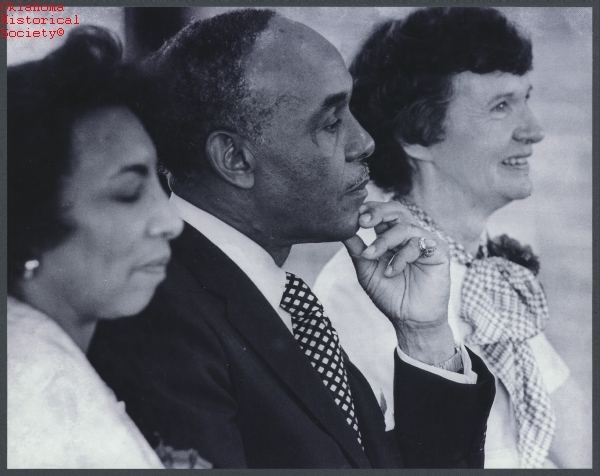 A librarian, a legislator, and an ambassador, Hannah Diggs Atkins was born November 1, 1923, the daughter of James and Mabel Diggs in Winston-Salem, North Carolina. Hannah married Charles Nathaniel Atkins and had three children, Edmund Earl, Charles Nathaniel, and Valerie Ann. In 1943 Atkins received a Bachelor of Science degree from Saint Augustine's College and later obtained a bachelor of library science from the University of Chicago in 1949. She held a number of positions as a law and reference librarian before moving to Oklahoma in 1952. She worked as the branch librarian for the Oklahoma City Public Libraries (1953–56) and at the Oklahoma State Library, first in the position of reference librarian, then as the chief of the General Reference Division and acting law librarian (1962–68). She also taught both law and library science courses at the University of Oklahoma. 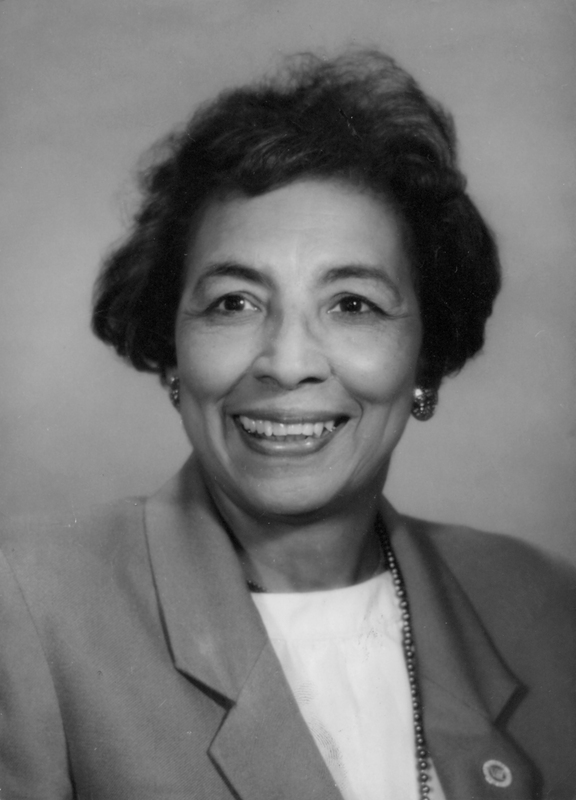 In 1968 Hannah Atkins was elected to the Oklahoma House of Representatives, and she served as the first African American legislator until 1980. During her term as representative she fought for child welfare, health care, tax and mental health reforms, and civil rights. In 1980 she was appointed by Pres. Jimmy Carter as a United States delegate to the Thirty-fifth Assembly of United Nations, an honor she considered the highlight of her career. After her term as state representative ended, Atkins was appointed assistant director of the Oklahoma Department of Human Services (1983–87) and later to the dual post of secretary of the state and cabinet secretary of social services (1987–91). She held positions and memberships in the American Civil Liberties Union, NAACP, National Association of Black Women Legislators, Oklahoma Advisory Committee to the U.S. Commission on Civil Rights, Oklahoma Chapter of the National Women's Political Caucus (co-founder), and Oklahoma Black Political Caucus (founder). She also served in different capacities in the Democratic National Committee. Throughout her career Hannah Atkins acquired numerous awards and honors, including Theta Sigma Pi Woman of the Year (1968), National Public Citizen of the Year (1975), Hannah Atkins Day, University of Oklahoma (1978), and Oklahoma ACLU Angie Debo Award (1980). She was inducted into the Oklahoma Women's Hall of Fame in 1982. She was also honored with an endowed professorship in the political science department at Oklahoma State University. In 1998 she received an honorary doctorate from the University of Oklahoma and in 2000 an honorary doctorate from Oklahoma State University. Into the twenty-first century Atkins continued to serve her community as a member of the Oklahoma Task Force for the Bombing Memorial. Hannah Atkins died on June 17, 2010. Hannah Atkins Collection, Special Collections, Edmon Low Library, Oklahoma State University, Stillwater. Opal Hartsell Brown, Indomitable Oklahoma Women (Oklahoma City: Oklahoma Heritage Association, 1994). Arthur L Tolson, The Black Oklahomans: A History, 1541–1972 (New Orleans: Edwards Printing Company, 1972). Stefanie Lee Decker, "Atkins, Hannah Diggs," The Encyclopedia of Oklahoma History and Culture, https://www.okhistory.org/publications/enc/entry.php?entry=AT002.